Spending time in the sun will leave you dehydrated. Not only does this result in headaches and dry skin, H2O is essential for hydrating your body and flushing out toxins. Aiding digestion to keep your bodily functions running smoothly and protecting your pelvic floor from unnecessary strain. If you are worried about little leaks, don't let this stop you from keeping hydrated. Keep up with your Kegel exercises and strengthen your pelvic floor so they are no longer an issue. Nothing is better than sitting in a pub garden with a cold glass of lemonade. But did you know carbonated drinks irritate your bladder? 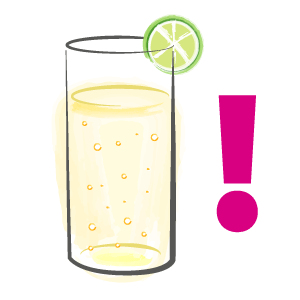 If you want to cut down on your trips to the loo, swap out fizzy drinks for cold squash, or even better - water! Caffeine, from coffee and energy drinks, is also a bladder irritant. Have eggs for breakfast to give you an energy boost that see's you through the morning. Watch the sugar content in fizzy drinks as well. It's no secret that sugar has a negative effect on your body. But did you know its effect on muscles? It makes them more brittle and vulnerable to wear. Less than ideal for the pelvic floor. You may be religiously applying suntan lotion to yourself and your loved ones, but did you know there are products available to protect your pelvic floor? Endorsed by Dame Kelly Holmes, EVB Support Shorts, Leggings and Briefs give your pelvic floor 71% extra support whilst you are on the move. Meaning you can exercise with confidence that you won't be having any leaks or making a prolapse worse. This time of year we are even more vulnerable to food poisoning. Be it from contaminated water on holiday, or leftover BBQ food that's been sitting in the sun. It's important that you keep vigilant about what you eat and drink. Getting constipated or suffering from diarrhoea causes havoc with your digestive system and can leave your pelvic floor sore and weak. 1. Continue with Your Kegels! It's important that you don't forget to continue with your pelvic floor exercises over the summer. Whether you have just started our 12 week boot camp, or you are a veteran of weekly maintenance. You should be as committed to your pelvic floor as you are with brushing your teeth. In fact, that's a great time to remember to do them. You don't want to be thinking about having to wear pads with your swimming costume, dipping in and out of the water and spending most of your time on the pool side with your towel around your waist. You can avoid those little leaks, and more embarrassing moments, by strengthening your pelvic floor. Did you know Kegel exercises can help you get a flatter stomach as well? Avoid sit-up's and other exercises which use your abdominal muscles heavily. When you contract your abdomen it pushes down onto your pelvic floor, straining it. Instead work on your pelvic floor. As it strengthens, your posture will improve and stubborn belly fat will disappear as your tummy is drawn in.